What a night! We are so proud that our Michelle scooped a key award last week at the Press Awards winning “Business Personality of the Year”. The award was in recognition of the journey Michelle has been on since setting up the business in 2011. And what a journey it has been too. In early 2011, Michelle was working in a large corporate and after some soul searching, realised that two of her core values, “Making a Difference” and “Having Fun” were not being realised and she needed to do something quite different to achieve this. So, in the summer of 2011, after spending a leadership day with horses (there’s another story!) she created a vision and took her passion and set up Pro-Development. From working in the back of her garage in Wilberfoss, Michelle is now running a successful business with a team of 5 supporting the growth of over 60 SMEs in Yorkshire and the Humber. The judges said “It was a really tough category this year as all the finalists had different personalities and all inspiring in their own right. They said awarding the title to Michelle is a testament to the true grit and determination she has shown to start a business from scratch and her passion has been a driving force”. The presenter of the award shared “The judges felt Michelle has an infection personality and we can all clearly see that and the award is also in recognition for the work she does more widely outside of the business to support the local community including recently becoming the new Chair of York Professionals. Collecting the award, Michelle had a standing ovation and the presenter said “We’ve had some responses in this room over the years but never one quite like that”! He then went onto to ask Michelle about why she felt she was such a popular choice. She said: “Well it has certainly been a journey but one of the things I have loved about setting up and building the business is all the amazing people I have met along the way. 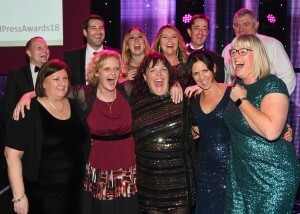 My team are incredible and a lot of the people in the room today have supported me on the journey, clients who are in the room who have also won awards and many people who have become good friends. I am very lucky”.